It feels like capitulation to turn the furnace on so soon, despite the fact the first cold of the season has made its way into the house – a sniffling, hacking reminder to put a big pot of chicken soup on the weekend to-do list. The soup can wait till tomorrow. Today’s task is to warm up the house without succumbing to the inevitability of central heating. There is still hope for an Indian Summer and, if luck is with us, the heat will stay off until November. So, baking all day it is (cookies, anyone?). And, who knows, the warmth emanating from the kitchen might draw the strange teenage mole creatures from their lairs. The cookies might loosen them up enough to talk instead of grunt. But let’s not get overly optimistic. Later on, crank up the heat a little and make a dish that’s perfect for this cusp between the seasons – a fall braise that uses the last of the home-grown tomatoes (they become super sweet) to keep it bright and summery. The subtle herbes de Provence and a little fennel seed add a surprising depth of flavour to the chicken. It’s both hearty and light. Serve it with a light red wine and eat in the kitchen where it’s still warm. Make a rub by mixing minced garlic, 1 teaspoon salt, 1/2 teaspoon pepper, 1 teaspoon herbes de Provence, and 1 tablespoon olive oil. Set aside. Toss together remaining ingredients (except chicken) and place in a large baking pan or Dutch oven. Wash and dry chicken and rub inside and out with the garlic/herbes de Provence rub. Place chicken in the middle of the pan, pushing aside the tomatoes and onions to make room. 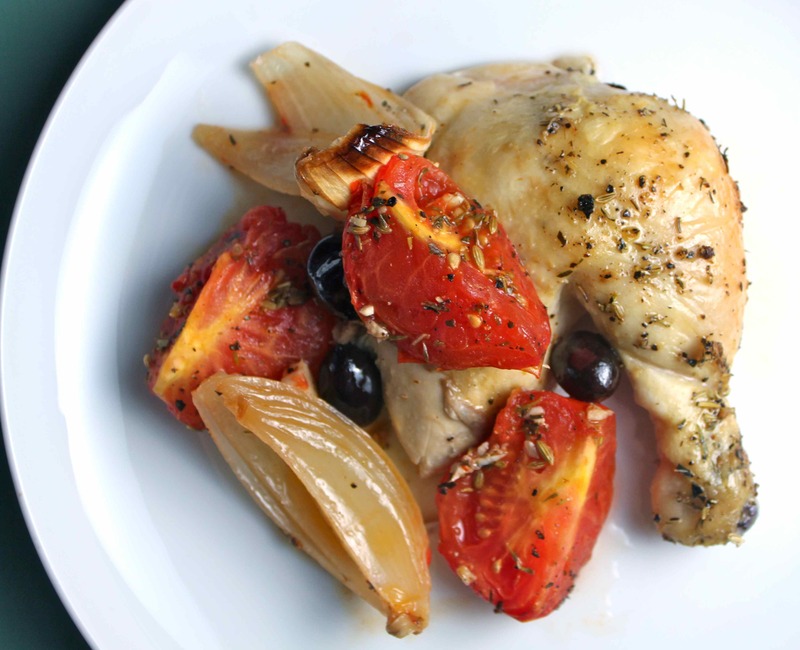 This entry was posted in Main Courses, Meat and Poultry and tagged autumn meal, braised, chicken, Herbes de Provence, main, olives, onions, Provencal, tomatoes. Bookmark the permalink.